When I chose four shows to preview before the Fall Season of TV started it was with every intention to at least make it to mid-season with all of them so I could make a fair assessment. Unfortunately I have failed in my efforts with 50% of them. While ABC’s Selfie was admittedly a last-minute choice in order to give a variety of genres in my preview (and we’ll address my issues with that a little later on) Gotham was a show I had looked forward to eagerly all summer. I’ve enjoyed the latest Batman movies mostly due to their dark nature and I had thought a TV show with a similar feel would be something I could get hooked on in fairly short order. I had high hopes and maybe that compounded my disappointment when Gotham lived up to none of them for me. Let me start by sending compliments to set design. The look and feel of the show was exactly what I would expect from what the synopsis offered. The colors were representative of the mood and motivation of the character currently being highlighted and the saturation when exploring the dark underbelly of Gotham City perfectly depicted the shades of grey in which the different factions operated. Unfortunately that is about the only positive thing I can find to say. The directing in the pilot episode was so choppy that it gave me a headache. Using a Go-Pro camera during intense chase sequences is a popular technique these days and not one I usually object to. But the speed at which the director chose to switch between that and a reverse angle made my head spin. The music was just as disjointed and the whole episode gave the feel of merely bouncing from one rushed scene to another. I was willing to accept that it may have been a directorial decision but the 10 minutes of the second episode I managed to get through felt the same. Along with odd pregnant pauses where it wasn’t clear why the actors were staring into space and the insistence that all dialogue was delivered in a confrontational manner with the actors nose-to-nose and spittle flying there were many strange choices affecting the overall look of the show. The cast of Gotham was something that had encouraged my enthusiasm. 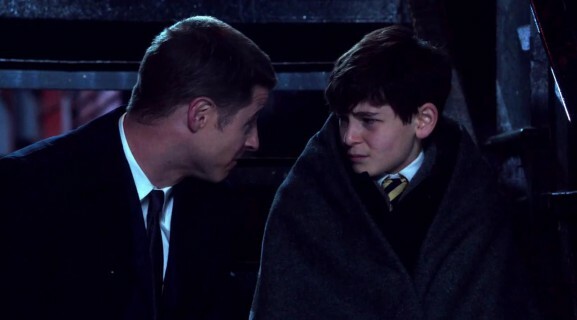 While I hadn’t watched a lot of Ben McKenzie’s work the trailers had shown an emotional side to him that intrigued me and seemed to be a departure from his previous roles. Donal Logue has long been a favorite of mine from right back in the days of his time on ER and I felt his gruff but lovable personality would be a perfect counter to the naiveté of McKenzie’s Gordon. In reality I encountered characters that were so fatally flawed I found it impossible to connect to any of them. All characters need to tap into a dark side from time to time, it keeps them human and honestly appeals to the masses. Dean Winchester from Supernatural is one of my favorite TV characters and his questionable morality is a large part of his appeal. But he will always come through and make the decision deemed to be right. I felt none of this with the characters in Gotham. In Harvey Bullock we saw a man willing to make a deal with the devil to keep his city “safe” but it was at the detriment to everyone around him. I kept waiting for the punchline, the moment when Bullock would say “Ah, yes, but see this is why I have to do this…” It never came. Bullock was violent, unforgiving and completely morally corrupt with no redeeming features. The relationship between Bullock and Gordon was so aggressive with no respect or affection that it’s impossible to believe they would work together longer than a week and neither man seemed willing to entertain the notion of a friendship with other colleagues. The pilot episode threw every single character at us at such a pace that there was no way to be able to keep them straight. Each back story was rushed through and what could have been subtle hints at who these characters were if the time had been spent to develop them became anvils hitting us so hard that combined with the trippy directing I felt like I was concussed. The only character I felt any connection to was the perceived “bad guy” Falcone! His justifications for his actions in the city made perfect sense to me and John Doman’s delivery was subtle and intimidating. In my preview I had expressed concerns over the size of the cast and as it turned out it was the biggest issue. I am not one to give up easily so after my disappointment with the pilot episode I pushed through and started watching the 2nd. The minute my beloved Alfred, played with such ease by the amazing Sean Pertwee, physically accosted young Bruce but then pulled him in to an apologetic hug, classic abuse behavior, I was done. Alfred was Bruce’s family, had always been portrayed as such in the movies, and to suggest he was ever anything less than kind was so disappointing to me. I’ve seen it written that people who were less than impressed with Gotham don’t understand that DC characters and their stories are supposed to be dark. I completely understand that; as I mentioned earlier flawed characters are actually my favorites. But to make them completely unlikable is something that is never going to hold my interest. I’m afraid I don’t have the patience to stick around that long. Non-relatable characters are also what quickly turned me off from Selfie. There was nothing redeemable about Eliza Dooley and honestly, her actions were often offensive. The digs the show constantly made about online friendships hit pretty close to the mark for me and a large number of my friends, online and otherwise. I understand that they were trying to get across that people have to balance online friendships and “in-person” relationships but the insults that flew were not complimentary. I gave Selfie the same as I gave Gotham – one and a half episodes – before I had to deem it a lost cause. Gotham was just picked up by Fox for a full season so there are obviously a lot of people out there who are enjoying the peek into Gotham City life pre-Batman. I cannot class myself amongst those, unfortunately, but I would love to hear what your thoughts are! Comment below! I could barely make it through the pilot but decided to give it a chance figuring pilots had to include a lot to get the underlying story told. I too was looking forward to the show. The second episode was so disappointing, it neither intrigued me nor did I find it entertaining. I kept getting up and doing other things which isn’t something I do on shows that are well written, acted and directed. I don’t see myself watching it again. I had nearly given up on it, feeling much the same as you, that it was stylistically beautiful, nearly a motion-comic. The wooden acting of Barbara Gordon & her ex-girlfriend is outright painful to watch still, but the show itself seems to be improving as it goes along. I enjoyed the episodes “Arkham” and “The Balloonman.” There’s something about it that feels nearly like Fringe to me, but Fringe was a much better show. That said, I nearly gave up on Fringe too after a few episodes, but kept pressing on and I’m so glad I did. Robin Lord Taylor’s Penguin is the most interesting character to me and they finally explored him more in the past two episodes. Gotham is definitely not on my must-watch list, but I’ll probably keep picking at it over DVR. I like this show because I feel like I’m watching as I would read a comic book. The cinematography and sets are excellent, and most of the characters are just like the exaggerated comic book characters…overly good ones, very evil ones, very helpless ones. Some of the actors aren’t selling their characters, i.e. David Mazouz’s young Bruce not working for me, Erin Richards as Barbara boring. Overall, I like the direction it’s going. I don’t have to put much brain power into the show… I’m being just entertained. Keeps my show repertoire balanced.